The Mahlke Chronicles: Summer Plans - Check. This spring I made a long list (23 items, to be exact) of things to do this summer. They ranged from little things, like park picnics, to big things, like cabin trip with friends. In reviewing the list, I am happy to report there is only one thing remaining to be checked off, and that will be completed Labor Day weekend. When my husband first saw the list, his eyes widened as if to say, "Here we go again!" He very much detests how I pack the summer weekends full of activities and trips and leave little room for spontaneous plans. I like to take full advantage of the very limited time we get each year to enjoy the nice weather. Summer is my favorite time of year! So this week we checked off a few more items on my Summer Plans list. Summer Plan #16: Spencie and Daddy Fishing Trips. 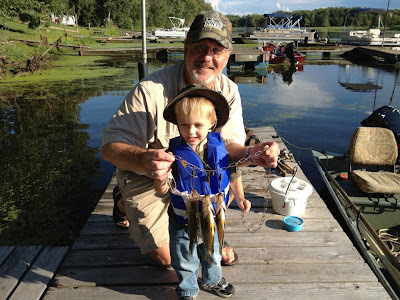 Last Sunday David took Spencer over to Grandpa Dave's to go fishing. 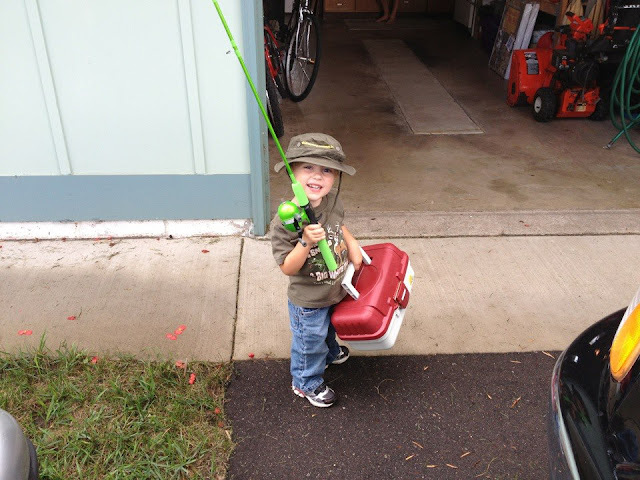 Spencer got to use his new fishing rod that he got for his birthday. He caught five fish. Then they ate fish for supper. I caught five, but only three were keepers. Summer Plan #13: River Trips. On Tuesday the boys and I met Dave at the boat landing after he got off work, and we took a boat ride to a river side restaurant in Wisconsin for supper. After eating, we parked the boat on a sand bar and played for a bit before returning home for bed. Long day: Ash feel asleep on the boat ride home somehow! Summer Plan #3: Oxbow Park. Friday we went to Oxbow Park right outside of Rochester to explore the small zoo. Spencer and Ashton both enjoyed feeding the goats. Then we hit up the mall in Rochester to allow the boys to run off some of their energy at the play area before supper. During the winter we retreat to this mall play area quite often to beat the winter time blues, but this is the first time Ashton got to play. He loved it! I believe I am going to have my hands (or should I say eyes) full this winter trying to keep track of two kids running around in the play area instead of one. We ate supper at HuHot Mongolian Grill (yum!) and dessert at Cold Stone (another yum!) before heading home. Last time to wear matching tye dye shirts of the season (Ashton's is getting too small). We got a family picture on this same spot last year (with Ash in my tummy), but we didn't have anyone to take the picture with all of us this year. Speaking of the summer winding down, I wanted to get the kiddie pool out at least one more time before it is deflated and stored for the winter. On Thursday we filled it in the morning and then waited for the clouds to clear and allow the sun to come out and warm the water. This never happened, but the boys enjoyed a short, cool soak in the pool anyway. Hopefully we'll be able to get the pool out one more time for a warm day in the sun to end the kiddie pool season on a better note instead. This week we did a science experiment to see how the colors yellow and blue make green when mixed. The actual experiment took a few hours to yield results, so I wanted to show my impatient toddler the results in a quicker fashion before beginning the experiment. I filled two small glasses with water, put yellow and blue food coloring into the glasses, and then mixed them to show how the two colors make green. Then for the actual experiment, I filled two glasses with water again, one with yellow food coloring and the other with blue. I placed an empty glass between the two colored ones. I put a twisted up paper towel from the yellow water into the empty glass, and did the same with the blue water glass. Then we waited. And waited. We checked back periodically as we watched the yellow and blue slowly travel up the paper towels and drip into the empty glass to make green water. This experiment delighted Spencer and he was excited to show Daddy when he got home from work. .....and went to Dave's work picnic, where they played games and got some fun prizes. Ashton turned 10 months on Thursday. This little guy is growing so fast! I organized his closet once again, putting away the 6-9 month clothes and bringing out the 12 month ones. It's fun watching as his personality comes out more and more each day. He is the complete opposite of his big brother and this has thrown me for a loop. A simple trip to the park now has become anxiety-filled as I literally hover over the dare devil while he goes head first down stairs and leaps for slides and teeters dangerously close to large openings meant for much, much bigger kids. My three year old is just now climbing and exploring the things that my baby doesn't give a second thought about. The differences in my children are exciting and exhausting! Until next week's installment, here are some random photos and videos from our week. Ashton decided to forgo the spoon for a much more convenient way of eating cottage cheese. Gotta love his creativity. This gate can't contain me, Mommy!! One day I found Ashton poking his head through the little kitty door in the baby gate, so instead of discouraging it as a conscientious mommy should, I ran to get my phone to record it! Helping Daddy load the dishwasher. His new lovey, Pilar the Catepillar.